Alexey Chirkov is the creator of this beautiful box. Alexey is fond of owls, and he has created a lot of boxes that depict various species of these enigmatic birds of prey. 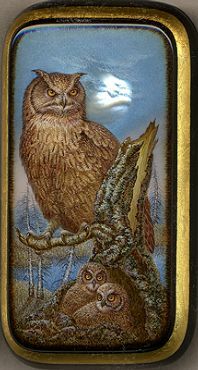 This box is from this series, and shows Owl sitting on the tree and watching for something in a dark of the Night. The scene is masterfully drawn over silver powder that beautifully shines through the oils. A large piece of mother-of-pearl that shimmers with bright undertones is set into the foreground, just over the owl. The painting is decorated with a gold line. The box is constructed from paper-mache. Black lacquer covers the exterior and red lacquer covers the interior of the box. The lid is hinged from the left, and the box rests on a flat bottom. The work is signed with the artist's name, Fedoskino, the year of 2008 and the title ("Owl and a Moon") on the box's exterior bottom.